Like the iMac and MacBook Pro before it, Apple has blessed the MacBook Air with Intel's 32nm Sandy Bridge family of CPUs. Despite being named similarly to the Core i5/i7 in the MacBook Pro, only dual-core Sandy Bridge is offered in the MacBook Air. The cases are simply too small to accommodate any 32nm quad-core parts. Also NVIDIA is completely out of the picture here. While the previous generation MacBook Air used an NVIDIA chipset with integrated GeForce 320M GPU, Apple is relying entirely on Sandy Bridge's processor graphics this round. Apple opted for ultra low voltage Sandy Bridge CPUs all with a 17W TDP. The previous generation used a 10W part for the 11 and a 17W part for the 13, but remember those figures didn't include NVIDIA's GeForce 320M which is good for at least another 14W under load, and probably a watt or two with the GPU idle. The 17W SNB parts include memory controller and GPU, leaving only the chipset at 3.4W. Max power consumption is likely lower on the new MBAs, although typical power consumption could be higher as Sandy Bridge cores are significantly faster than the Core 2s used before. All three parts support Hyper Threading and Quick Sync, although the latter remains mostly unused in OS X. The 11 comes with a 1.6GHz part by default while the 13 ships with a 1.7GHz chip. Both can be upgraded to the same 1.8GHz Core i7, a big change from last year's lineup where even the upgraded 11-inch model was slower than the base 13. Turbo is fully supported at the default Intel ratios (more on confirming this later). This is actually a pretty big deal because it means that for single threaded applications you actually get similar performance to a MacBook Pro. It's only in the thread heavy stuff that the Pro machines will pull away. The default chips for both systems comes with 3MB of L3 cache. The majority of quad-core parts only have 6MB of L3 and seem to do just fine, so I don't expect that this is too big of a deal. The upgraded 1.8GHz CPU comes with an extra MB of cache. You'll see this in the performance section but there's just no comparison between the CPUs in the 2011 MacBook Air and what Apple shipped last year. 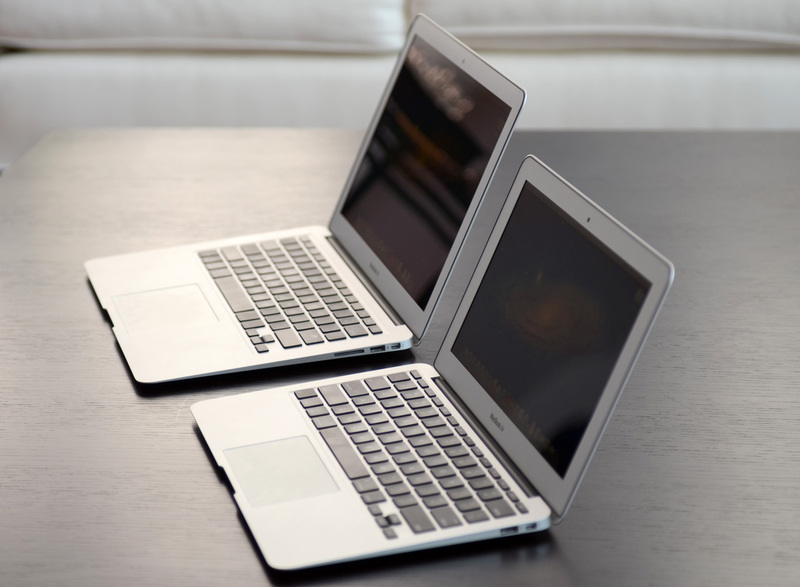 If the MacBook Air wasn't fast enough for your last year, the 2011 models should change that.